Firstly, it is worth mentioning that you should always ask what their prices are before committing yourself to a seat in the barbers’ chair, as they have been known to charge odd sums of money when really they all have a standard price list. Each hairdresser also has to be registered, although we have no idea who you may complain to if you feel that they have done a hatchet job on you – only joking, they are all very professional! Firstly your stubble (or beard!) will be washed with warm water to soften up those rigid bristles. The barber will then whip up foam in a cup using traditional ‘traş’ soap and apply a first layer to your chin, neck and sideburns. While that is soaking in you will often be treated to a neck and temple massage which is pretty tame and gentle! 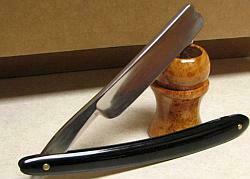 The second coat of shaving soap is then applied to the same areas as before, and the barber will work his magic with his razor or ‘ustura’– here they are a typical straight razor that flicks open like a pen-knife. Obviously you can ask for your gorgeously manicured 70’s sideburns (barbet in Turkish – this might be a useful word to know perhaps!) 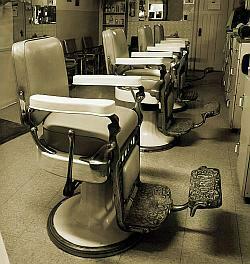 to remain intact, but the barber will see the way they are usually done and won’t whip them off! If you are unfortunate enough to suffer the odd nick whilst the barber is shaving you he will produce what is known as a ‘blood stone’ or ‘kantaşı’ in Turkish. This involves a quick rub to the nick which will stop the bleeding immediately. Now for your cheekbones, should you have any hairs that you would like removed. This is the real treat for and there are two ways of removing unwanted cheekbone hair, one of which could be said to be slightly uncomfortable perhaps! Firstly, the barber can eradicate hair by dipping cotton wool into some pure alcohol, then lighting it and brushing it quickly over the cheekbones. Don’t worry its not painful or dangerous but there is a faint whiff of burnt hair after! The second way is to use a length of cotton, which is then twisted and drawn across the cheekbone, plucking out the hairs; this is the one which can be slightly uncomfortable! To finish the look you can have wayward nasal and ear hairs toned down a bit too if you’d like! 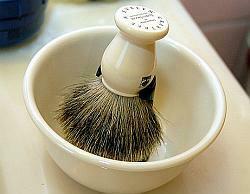 The barber will use the modern little shavers to do the nostrils, but the ears will be done with the cotton wool and alcohol method. Finally, just so everyone knows you’ve just been to the barbers, the traditional lemon essence cologne is patted around the shaven areas and to top it all off a good slap of moisturising face cream. Baby, smacked and bottom are all words to describe your finished appearance, but, you will certainly feel refreshed and invigorated to go along with that! If you visit one of the barber shops located in the tourist areas then you are more likely to receive a more ‘authentic’ experience with no questions asked, and they may also give you a shoulder massage too along with a Turkish coffee or tea. One friend accepted the offer of c offee, but didn’t realise that the barber would stop cutting his hair and stand and wait until he had finished it, slightly detracting from him enjoying his coffee! Aside from this, you shouldn’t expect to pay anymore than 30TL for a shave and haircut, 20TL if you are away from the tourist areas. We would tell you about the hair cut side of things, but there’s nothing too unique here. You can have clippers or scissors and tell the barber what you would like. 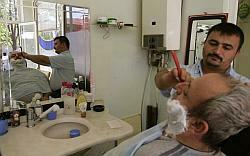 They usually keep showing you what they are doing with the mirror just in case they go too far!So there you have it, a visit to a traditional Turkish Cypriot barber shop – now don’t be scared, give it a go; you’ll feel years younger afterwards!